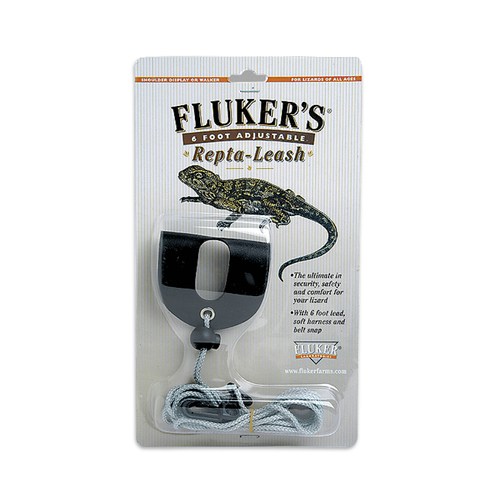 Repta-Leash for reptiles. Take your cold blooded companions out for a walk! The Repta-Leash is the ultimate in security, safety and comfort for lizards of all ages and sizes. This leash has been designed with a soft harness for maximum comfort and durability, and has a tightly braided lead that reduces fuzz and pilling. Enjoy a nice outing with your reptile. Each leash has 6' adjustable lead. Press button on ball and slide to form a loop that will fit over your pet's head. Next, place pet's legs into openings on the harness, adjusting until harness fits snugly against the pet's chest. Slide ball down to pet's back.